When Maker’s Mark president Bill Samuels Jr. and his master distiller, Kevin Smith, decided to make their company’s first new bourbon in over 50 years, they could have gone the well-traveled route: an extra-aged, high-proof whiskey with “reserve” in the name (and a price tag well over $50). But their whole philosophy goes against the whopping spice, caramel, smoke and tannic flavors that can come from extended time in charred oak barrels. They’re all about toasty, mellow, vanilla — a flavor profile they get by blending whiskey from barrels that rotate through three-story rickhouses (barrel-aging warehouses) for a “mere” six to eight years, compared to 12-20+ for some boutique bourbons. So, they decided to simply take their regular Maker’s Mark bourbon and amp it up it somehow. But how? Enter the wood chef. I admit I laughed when I heard that term, too. 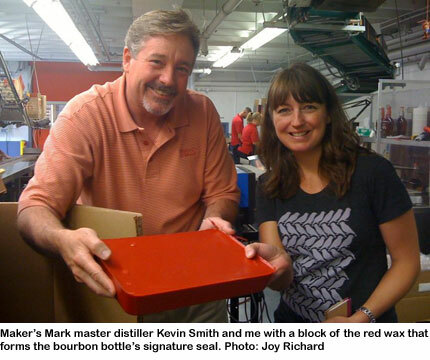 (Disclosure: Maker’s Mark flew me down to Kentucky to check out the distillery.) But I realized it wasn’t a stretch when I talked to the chef himself, Brad Boswell of the Independent Stave Company. Boswell’s family has been making oak barrels for aging spirits and wine for 98 years. And lately, they have brought a healthy dose of science to their medieval craft. They begin with a thorough understanding of the chemical composition of different species of oak, and of the appropriate length of seasoning (aging oak staves in the open air) for the intended beverage. Then they cook the staves or finished barrels according to a library of recipes that “pinpoint layers of flavor” between toasted and charred, says Boswell. Basically, he can make you a barrel that imparts to its contents the exact characteristics you’re looking for. It took 125 experiments — many of which “sucked,” says Smith — to hit upon the right wood recipe, one that was entirely new in bourbon making. It begins with French, rather than the standard American, oak staves. Those staves are seasoned for a long 18 months, which lowers the wood’s tannins and intensifies its vanillins. Boswell then tried a new cooking technique: he seared the staves on both sides, like a steak, to just short of charred. Boswell catalogued this recipe as Profile No. 46. Smith arrayed 10 of the staves in an empty Maker’s barrel, then poured the fully matured bourbon back in to rest for about nine weeks. The combination of the seasoned French oak and Boswell’s searing method gave just the sweet toastiness and spicy notes — think cinnamon instead of rye bread — that Maker’s wanted. 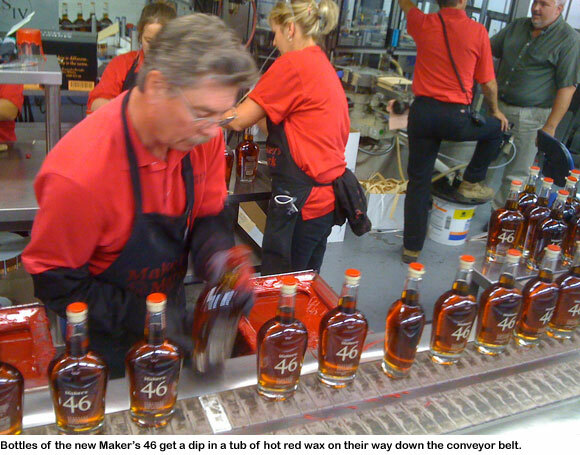 Samuels and Smith had their new product, and they decided to name it Maker’s 46, after Boswell’s special wood recipe. This may all sound pretty esoteric, but the result is a bourbon quite different from Maker’s Mark. The 46 has a dry spiciness, a rich texture and a higher proof (94 compared to 90 for the flagship) that are sure to appeal to the bourbon, and even rye, adventurer, without alienating the devoted Maker’s Mark drinker. And it’s reasonably priced at about $10 more than traditional Maker’s, which is usually $23 to $25. 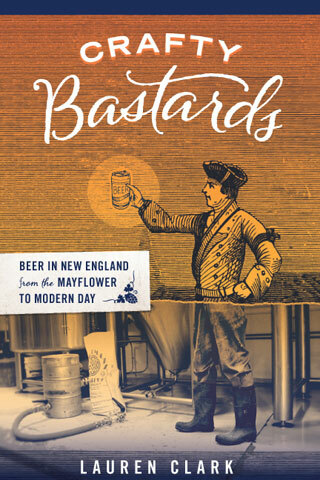 Maker’s 46 will be available in Boston sometime next month. The 70-year-old Samuels, a seventh-generation distiller who is nearing retirement, seems pleased by the new whiskey. He admits that it arose partly out of market demand for something new and exciting from Maker’s, which largely created the premium bourbon category that is now exploding. But he also wanted to be remembered for something other than faithfully reproducing his father’s bourbon recipe from the 1950s. Now his nightmares of a tombstone that says, simply, “He didn’t screw it up,” are over. Coming up: my tour of the Kentucky bourbon trail. I attended the Slow Food Nation Come to the Table event over Labor Day weekend in San Francisco. I enjoyed some sips and learned quite a bit. 1.Â You can spot a “meeting” anywhere. You know what kind of “meeting” I mean. 2.Â Spirits just graduated from the Slow Food kiddie table. Slow Food Nation needed persuading that spirits should be allowed to Come to the Table, literally. Imagine, they had to defend their right to be there. (More about rights in a moment.) As much as wine (which Slow Food invited to the table from the beginning), spirits are a product with direct consequences for the environment, the workers that produce it, and the people that consume it. Allen Katz, board chair of Slow Food USA, and Gregory Lindgren, owner of Rye Bar in San Francisco, note that leading bars began furthering the art of the cocktail by using fresh, seasonal fruit. If that doesn’t exactly make them Slow Food Royalty, it does elevate the cocktail from an Archie Bunker brew to a quality culinary experience. Our Prairie Mary, for example, was made with organic, local Early Girl tomato juice, ancho chilies, rosemary and Prairie Organic Vodka (distilled in Minnesota with local, organic grain). 3.Â The Godfather of the American Cocktail was Jeremiah P. Thomas. “The Alice Waters of his time,” according to Katz. He was, by all accounts, quite the entertaining and industrious barman. He wrote one of the first bartenders’ guides, called The Bon-Vivant’s Companion (1862), and invented cocktails (and claimed to have invented even more). He is credited with elevating the bartending occupation to where it has recently returned. Maybe that was covered in the poli-sci class I never took. A universal right? Really? 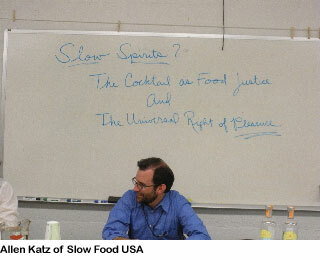 That was actually part of the workshop title: Slow Spirits — Food, Justice and the Universal Right of Pleasure. The “Food, Justice” part was more palatable for me than the so-called “Universal Right” part. It’s a nice idea, but I’d hate to look a starving child in the face and tell him about my universal right to have a cocktail. Then again, if I had to look a starving child in the face, I’d need a cocktail. Probably several. Mother Theresa, I’m not. 5.Â Demonstrating the validity of slow spirits’ right to be, we learned about parallel aspects of food and spirits’ production. Just as some farmers are farming organically without paying for the certification process to acquire the official label, so it is with liquor producers. Safe to say many workshop participants were surprised to learn that the second of our tasting samples was Maker’s Mark — not a brand that touts its green cred by selling its story with a green spin. 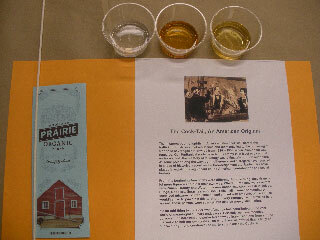 Maker’s Mark uses locally grown grains (corn, wheat, barley). Their distillery sits on a state-certified nature preserve, and they return water to their spring cleaner than when it was extracted. They re-use or recycle the spent grain (keeping local pigs and cows happy) and harness the energy of anaerobic digestion to power their stills. Kudos to Maker’s Mark for not bludgeoning us with how green they are. But they are! This was a well-rounded evening. Like any good night at the watering hole, I walked away happier and with insights I didn’t have before the evening began. Jacqueline provides more details on the spirits featured in the workshop here.